New build 3 bedroom apartment with ensuite toliet and shower in bedroom 3. On the beautiful West Coast. 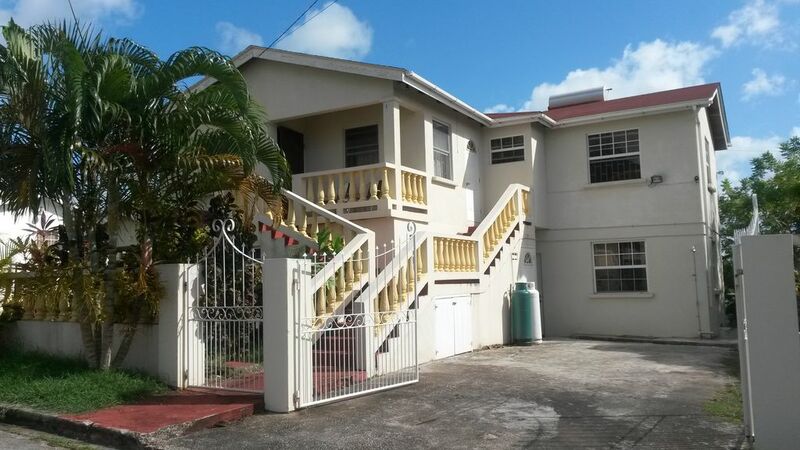 Heywoods, St. Peter, Barbados 5 minutes walk from Speightstown, a quiet and safe neighbourhood. The house has air conditioning in the living/dinning rooms and wall fan's in the bedrooms. It is in close proximity to Almond Beach Village St. Peter. The property is fully furnished with a flat screen TV, DVD, broadband Internet, washing machine, bedding, towels and accessories. Smoking is not permitted inside the property but is quite acceptable on the verandas. 10 minutes walk to shops. The rental prices displayed are for up to 4 persons. Each additional person would cost extra. Maximum 2 additional persons. Hire cars available upon request. A full driving license is required in order to obtain a driving permit. Note: When at the apartments please keep noise levels low in the early hours and late at night in consideration for other guest's in the apartments and the neighbours. Very nice clean apartment. Extremely quiet area. Need a car to reach shops and beaches. Thanks to our latest renter for such encouraging comments on the cleanness of the apartment and quietness of the neighbourhood, and to those who will be renting our apartment in future, we will try to see that things in the apartment are kept in a clean manner and assist our clients in the best possible way. Sorry we are not in a position to assist with any form of transport to the shops and beaches, something to contemplate on in rendering a service of transport to those who will stay at the apartment. Thank you for your very encouraging comments on the cleanliness, and also the friendly neighbourhood in which our apartments are situated. The Holder's family are glad to hear from you and we hope that you and your family will be able to stay at one of our apartment in future. Enjoyed yet another lovely stay. Close to the beach, shops and everything else you need is provided within then apartments. Speightstown is a lovely part of Barbados, we enjoyed walking in to the little town, beautiful beaches, lovely places to eat and drink and not so busy as other places on the west coast, the apartment was quite basic and very clean and suited our needs the price was very good, Gabriel was very helpful and nothing was too much trouble, the apartment is in a residential area only 10 minutes easy walk from the beach and village shops, the bakery opposite The Orange Street Bakery ( also very good)is well worth a visit, Little Bristol beach bar does good food and has a good atmosphere,Jordons supermarket stocked most things you need and we also bought tuna and marlin from the fish market at a very good price. It was wonderful to see monkeys on our first morning on the telegraph wires in front of the apartment as well as hummingbirds, the only negative comment was the neighbourhood dogs constant barking. Thanks very much for your comments concerning your visit to the Island of Barbados. I am delighted to hear that you were well looked after by our Gabriel as nothing was too much trouble for him to undertake. I am glad to hear that you have enjoyed the food, the lovely beaches, the friendly atmosphere and hospitality shown to you as you travelled around the Island-the cleanliness of the apartment that suited your needs as well as the reasonable price you willingly paid. All in all it seems clear that you had an enjoyable holiday with the exception of the barking of the dogs in the immediate neighbourhood. Sorry to hear about such, but I hope that this will not deter you from visiting the beautiful Island of Barbados again and using our apartment, which I hope will be more updated. Thank you once again for your encouraging comments which we very much take on board and appreciate. Nous avons apprécié notre séjour dans l'unité du haut en avril 2017. L'unité est très propre, cuisine très fonctionnelle il n'y manquait absolument rien. C'est un endroit calme dans un secteur résidentiel a 5-7 minutes a pied du terminal autobus. Donc les déplacements etaient très facile en autobus. Gabriel nous attendait come convenu et nous a suggéré quelques endroits a visiter.Très apprécié. My sister and I stayed in Apartment A (upstairs). We had a lovely stay in the apartments, with no complaints. It has everything you would need for it to be a comfortable stay, plus fabulous showers! I am delighted to hear that you both had a lovely stay in our upstairs apartment and your holiday was an enjoyable one. The Holder family do try to make things as comfortable as possible for all our guests who stay in our apartments, as we like to know that they all are treated in the same way we would like to be treated. We hope and pray that you will come again when time permits you in doing so, and you both will be always welcome to stay in either of our apartments. Thank you both very much for your kind words of which they are very much appreciated by the Holder family. God bless you all richly. This property is located in Heywoods Estate in the parish of St Peter on the west coast of Barbados. The west coast is known as the platinum coast for its beautiful beaches and pristine calm waters that is perfect for swimming, snorkelling and scuba diving. This house is located very close to the fabulous Heywoods Beach.